For better or for worse, I have been listening to Sean Hannity’s radio program on a regular basis for a number of years. 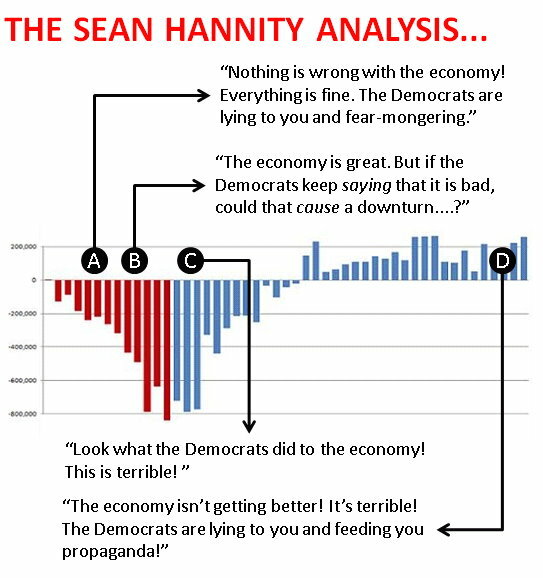 One thing that I have found interesting, when considered over a long period of time, is the way that Sean talks about the economy. In the last few months of 2008, Democrats were sounding the warning alarms about the economy. They were talking about unemployment and the housing market, and predicting very serious problems on the horizon. All of these dire sounds coming from liberals made Sean Hannity angry. The economy is fantastic, he said. People are doing well, he said. All of this talk about economic collapse is just liberals scare-mongering and pushing out propaganda designed to make George Bush and Republican economic policies look bad. As the year went on, however, I noticed a slight change in the way that Sean was spinning the situation. Oh, he was still saying that everything was fine: the economy is strong! Anyone who says that the economy is weak is just anti-American! But then he began adding another twist to his monologues: Is it possible that the Democrats will scare people so much, by calling the economy bad, that they could cause the economy to get worse? Is it possible that the Democrats could freak people out so much with their talk of a “bad economy” that it could become a self-fulfilling prophecy? Then something happened: a Democrat was inaugurated as the President of the United States. Within a month, the story changed: not only was the economy now weak and collapsing, but sure enough that “prediction” that Sean had made the previous year magically had come true! It was the Democrats that had caused the economic problems, by talking about it. All of this is sad and funny, but also old news. I am only reminded of it now because there seems to be a similar pattern (or perhaps a “complementary” pattern, a mirror-image) going on again now. All of the economic indicators show that during president Obama’s term so far the economic collapse was stopped, reversed, and has started to climb back again. Unemployment is down, economic growth is up, the stock market is up. So what is Sean saying now? The economy isn’t recovering! Everything is terrible! Everything is as bad as ever, or worse! People are suffering! There is no recovery going on! It will be interesting to see what he says in the months to come…. No, wait. Strike that. It will not be interesting at all. It will be completely and utterly boring. Because I can tell you exactly what he will say for the next 12 months if the economy continues to improve: if Obama is re-elected, he will say “it was going to recover anyway”, and if Obama is not re-elected he will claim that the entire recovery was caused by businesses eagerly anticipating the glory and economic certitude of the upcoming Republican presidency. Not particularly interesting at all.